Singing bowls awaken a beautiful and powerful mystery. They produce the sacred sound of AUM. Their rich vibrations alter space, mind, and time. The sound and music of the bowls awakens cellular memory and permeates the aura with healing energy. Tibetan bowls use vibrational sound to reduce stress and feel balanced. During our waking state, the normal frequency of our brain waves is that of Beta. Sound tools entrain the brain to move into the deeper Alpha and Theta brain wave frequencies. These are the frequencies that induce deep meditative and peaceful states, clarity of mind and intuition. Science has recently begun to study the effects of sound on the body and how sound can be used for healing. In fact, at the Strang-Cornell Cancer Prevention Center, singing bowls are used to help cancer patients. By learning to listen and accepting the sounds created by the singing bowls, we are able to better surrender to the sounds that enter the body and help attain a tranquility and peace as you let the vibrations work their way through your mind, body and soul. What are sessions like: The client lays on the floor. I provide blankets and pillows for your comfort level. The client should wear loose and comfortable clothing. 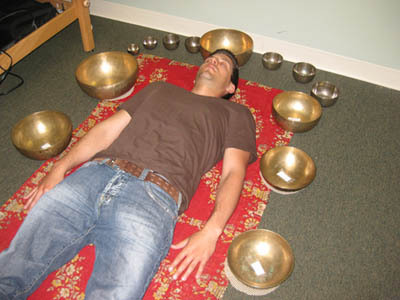 Tibetan bowls are placed all around your body as I strike the bowls.